In the event of a power-outage, or complete disaster, you will need certain non-electric kitchen tools. Let’s say that you’ve successfully put away a stock of wheat. You will need to grind it for flour, or crush it for salads and pilafs. The traditional heavy metal meat and vegetable grinder, which attaches by vise to a table or counter-top, is necessary. If you have stored-up a load of coffee beans (whole coffee beans, like wheat “berries”, have a much longer shelf-life than their ground forms), you will need a high-quality, hand-operated coffee grinder. See my Survival Tools link-list on the right side of this page for sources. 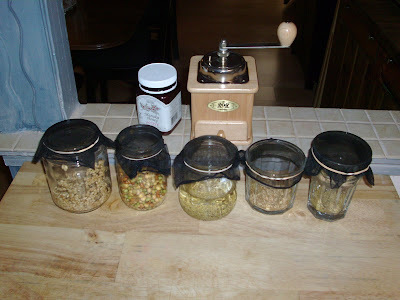 Here is a photo of my sprouted grains and seeds, showing my hand-operated coffee-grinder. A great way to always have some form of cheese, without refrigeration, is to buy economy-sized containers of grated Parmesan cheese–the kind which comes in the plastic cylinders. Kraft has a nice product; check its packaging for shelf-life prospectus. As in my previous posts about dehydrated foods, et cetera, I’m not posting this information for food-snobs, but for people who wish to be prepared for disaster! You would do well to lay in a supply of pasta and powdered eggs, as well as olive oil and nuts. It may not be the most nutritious food, but there’s a lot you can do with pasta. A recipe I devised years ago is this: sauté some walnuts and chopped garlic in olive oil until they are brown. Add it to your cooked pasta, together with shredded or grated Parmesan cheese. Eggs, of course, are nature’s perfect food, in my opinion. Adding Parmesan cheese to an omelette yields a delicious dish, especially when it also contains tomatoes, sun-dried or fresh. Both pasta and egg dishes are enhanced by dried parsley and chives–two other items to have on hand when it seems that the end is at hand!